In an interesting turn of events, my mom and brother decided to stay another night in Ohio, so they'll be here this afternoon. It's for the best, I think ... it gave me a little extra time to clean and organize my apartment and get one last big workout in. They're en route right now, about five hours away. I'm supposed to do my weekly long run today, 5.25 miles. Unfortunately, my gym doesn't open until 11am, and I'm concerned about cutting it close with their arrival. I think I am going to get there before it opens, already wearing my running stuff under my street clothes so I can get there, run, and then race home. If I take the bus from the gym to my apartment, it's only about six minutes; if they call and say they're at my place and I'm not there yet, it will be easy for them to either wait a few minutes or drive up the road to meet up with me. It will all work out! 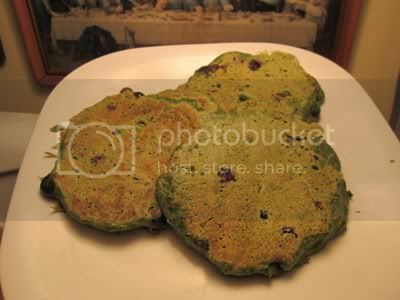 Yesterday's breakfast was spinach blueberry pancakes, and they were so delicious that I am having them again this morning! I've made spinach pancakes before, though I used frozen spinach. Now that I have a food processor, I can make them the way Mary's recipe originally stated, which uses fresh spinach. It made a *huge* difference - the frozen spinach ones would be good with savory toppings, but the fresh spinach ones worked really well with fruit. Mary had hers with maple syrup, but I just ate mine plain to focus on enjoying the taste of the berries - I am so ready for summer produce! In a food processor (or blender), finely chop the spinach. Add all ingredients except berries and mix thoroughly. Gently fold in blueberries. Then you just cook them like regular pancakes. Easy peasy! Be sure to remember the baking powder, otherwise they're a little dense. (Made that mistake yesterday. Not bad, but today's are decidedly better because they're much lighter.) Yesterdays had vanilla extract and they were delightful; in today's, I used orange extract, and took it up a notch. The spinach flavor isn't overwhelming thanks to the tart sweetness of the berries. A-mazing. Of course, breakfast foods are my favorites, so I'm a bit biased. But I think even my kid brother would like these! Maybe later this week, we'll find out. I love new recipes and I am going to try this one. Have a great Sunday with your family. bravo, so focused even with family arriving! that's dedication anmd i'm impressed! keep it up you rock! those look amazing! you say fresh spinach - is it fresh cooked spinach or fresh raw spinach? If raw, how do you measure 1 cup of it - stuff it (packed or loose) in the cup? Second time I've heard of these spinach pancakes. I don't get it, but I believe you that they are delicious. Spinach....delicious ~ Hum!?!?! yum! Have fun with your family! I'm going to try these. If I fix the recipe that you poseted, do you know the calorie count? odd. I would have never thought to add blueberries to spinach. I am not sure if I am courageous enough to try this out.